We take great pride in making our clients feel confident about their jobs during the production process. 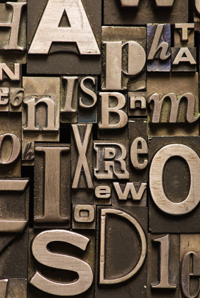 To help you gain a better understanding of what’s happening to your project, we’ve compiled a glossary of printing, copying and mailing terms that we commonly use in our industry. Author's Alterations or Author's Correction. A process of altering the copy to reproduce desired product. The ability of a mailing piece to be processed and sorted by machine instead of by hand. The result is lower postage costs and faster delivery. Barcodes are a series of vertical bars that are added to a mailing piece that represent the correct delivery adrress information. These barcodes are ready by machines that process mail and pinpoint the delivery location at the USPS. Base sheets are preprinted shells that will be used later. Base sheets are large quantity orders usually requested for newsletters and business cards in one or more ink colors. Base sheets save you money because the additional information can be printed in only one color ink or duplicated on a copier. A domestic service offered by the USPS that allows pieces bearing a specific address or label format with a permit number to be mailed with prepayment of postage. Tyler can help you obtain your BRM permit from the USPS. Paper that is coated with chemicals to produce copies without carbon in between the sheets. CASS stands for Coding Accuracy Support System which is a service to improve the accuracy of addressing information including zip codes, carrier route data and more. The USPS requires CASS reports for discount mailings. A process of copying computer file(s) to a cd. CMKY is for four color process printing. It is the term of the inks used for that type of printing. Cyan, Megenta, Yellow and Black inks are used to create all ink colors. Compose is to set copy into type. A copyright prevents use of material(s) without the permission from the originator. A stiff rigid paper used for postcards, manual covers, table tents, pamphlets etc. Deduplicating (or Deduping) is a preocess which identifies duplicate records by name and/or address in a mailing list and removes them if desired. The process will almost always save you money. Design is to create an image or product which is to be reproduced. DPI is dots per inch. Endorsements are tools that allow mailers to keep track of customers when they change locations. Four key endorsements may instruct the USPS to return the undeliverable mail to you, forward it, provide you with a copy of the address change, or a combination off all services. USPS fees do apply to some of these services. File Transfer Protocol (FTP): The Standard method of transferrring files using TCP/IP. FTP allows you to ransfer files between dissimilar computers, with preservation of binary data, and optional translation of text file formats. For instructions on how to send us files, press the send files button at the top of the page. Film is a special paper which the reproductive image is captured. We also call film negatives. Many low cost printers of four color commercial printing "gang run" to reduce costs. We Do Not Gang Run. Gang run produces inconsistent color and often does not match the color proof submitted to the client resulting in dissatisfaction and often rejection when the final job is received by the client. When a printer gang runs he puts one job behind the other on the same press sheet. He is ganging up jobs to save costs. The problem arises when the front job requires more of one color (i.e. cyan) and the job behinds it requires less cyan. The pressman has to go somewhere in the middle and both jobs will not match the proofs submitted to the client. We owe our high reputation to the fact that We Do Not Gang Run. One tof the way to determine if a printer gang runs is to ask "Do you guarantee to match the color proof?" If there is any equivication in the answer it is very likely he gang runs jobs. We Guarantee To Match The Color Proof. A gate fold is two parallel folds that do not overlap and open up like a gate. Gloss paper is paper with a clay coating that has been calendared to a shiny finish. Indicia is a imprinted designation on mail that denotes postage payment. Inserts are extra printed papges that are inserted loosely either by hand or machine into printed pieces or envelopes. An invoice number is assigned to all completed jobs. This number is used for record keeping purposes. A number assigned to a printing project used for job tracking. Also used to retrieve old jobs for reorder, reprints or reworking by customer. Laminate is a protective transparent film that is applied to paper by heat and pressure. horizontal page orientation where the width is greater than the height. LPI is lines per inch.